Carol's Cedar Cellar is located at 111 3rd St NE in Roseau, Minnesota. 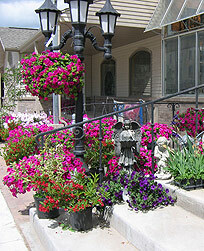 Our store and garden center is all located at this location. To speak with our friendly staff, feel free to call us at (218) 463-1472 or email us at carols@wiktel.com. Call (218) 463-1472 for more information! ©2006 Carol’s Cedar Cellar - All rights reserved.